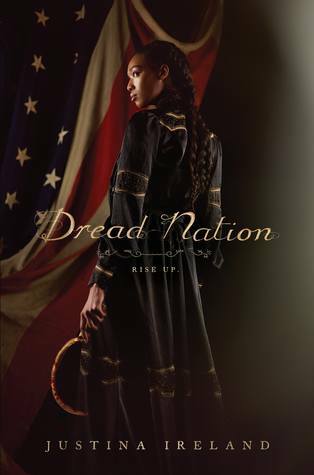 Making Gumbo | Making Gumbo In The University » Blog Archive » My most surprising read of the summer; DREAD NATION by Justina Ireland. My most surprising read of the summer; DREAD NATION by Justina Ireland. War Between the States is ended because of the sudden appearance of Zombies; Shamblers. I was skeptical. Sounded a bit gimmicky. But I was drawn to it by the book cover. A young black woman dressed, literally to kill; carrying a sickle. Blacks, you see, “negroes,” are put in schools to be trained to fight, to protect whites from these shamblers. So that young woman on the cover must be the hero of the story. I was intrigued, but still skeptical when I bought it, and put it on my bookshelf. Then one day, I picked it up, looked at the cover, opened to the first page, read the first line and two days later was done. Zombies in the time of confederacy yes, but used as a way to show the psychology of slavery and the bravery and genius of resistance. A novel that is surprising because it is so subversive. Catching you off guard because it could be a frivolous zombie-novel but isn’t with its insistence in making the reader think about the problems of slaveholding yes, but also the problems created by the whole psychological-walls that a society must build to make it work, and the psychology it leaves lingering in its aftermath. Subversive by making the reader think about the inner decay of the whole social structure by simply hinting, mentioning, all the groups that get put into the category of “other” to support white supremacy. Subversive by making the reader think about how unsustainable the “othering” is because humans will always strive for freedom. Subversive by making the heroine a young, educated, biracial, mocha-skinned African American girl. All that in an entertaining, exciting, scary, fast-moving story.